Two Texas A&M University geophysics professors, Drs. Masako Tominaga and Patrick Fulton, recently conducted field work on Monarch Mountain in British Columbia, Canada with the accompaniment of undergraduate, Noah Vento, and a science writer, Rebecca Fowler. 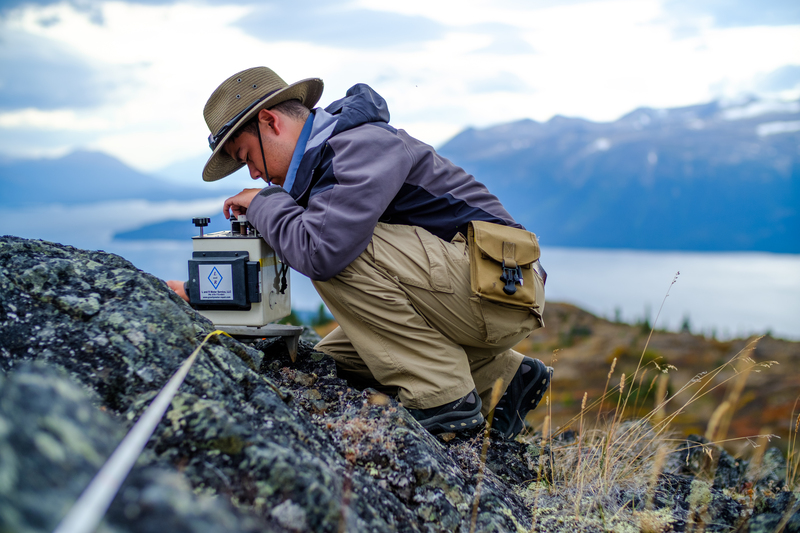 Undergraduate student, Noah Vento, uses Lacoste and Romberg Gravimeter in British Columbia, Canada field work (Photo by Patrick Fulton). Tominaga, the project’s lead scientist, is a marine geophysicist who usually goes on cruises to understand plate tectonics, but was able to find oceanic lower crust and mantle exposed on land. Tominaga aims to create a field-based method that will enable scientists to directly observe and track the naturally occurring process of mantle rock carbonation, where one type of rock, peridotite, is transformed into another. Fulton primarily oversaw the collection of geophysical data using a magnetometer and gravimeter. Monarch Mountain sits on a geological landform called an ophiolite, which is where the Earth’s lower oceanic crust and upper mantle are now exposed at the surface due to tectonic processes. Ophiolites provide the rare opportunity to verify the geophysical properties of these rocks by collecting measurements where the rocks can be directly sampled and their alteration state identified in contrast with remote sensing techniques where these alteration states can only be inferred geophysically. The Texas A&M team, with support from the National Science Foundation and NASA, is investigating peridotite (a mantle rock) by gathering geophysical data and rock samples that may yield new insights into the properties and structure of the Earth’s interior. They’re hoping that with peridotite rock samples they will be able to determine how peridotite naturally changes into different rocks through geochemical processes. The team continues to analyze their data and hopes to identify transitions of alterations between different mantle rocks. “This research will allow others to understand how rocks get altered with different fluids, which has applications for CO2 sequestration. It also improves our ability to characterize the structure of the oceanic lithosphere using remote sensing geophysical techniques.” said Fulton. Recording the processes of serpentinization and the carbonation of peridotite using gravity and magnetics data taken at regular intervals, the team hopes it will help to fill in the gaps about how mantle rock reacts with carbon dioxide and water.